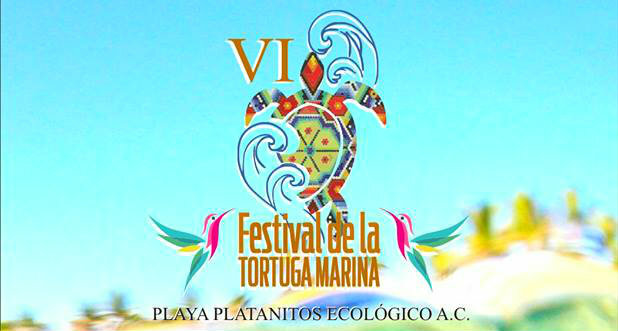 The festival is organized by Playa Platanitos Ecológico from July 21-22, coinciding with the sea turtle hatchling liberation season. 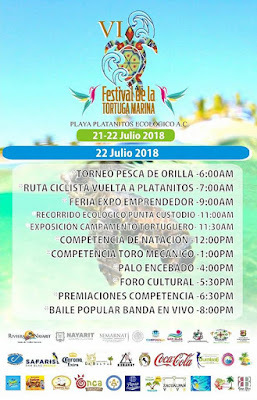 Playa Platanitos, a coastal village in the Riviera Nayarit, is preparing for its signature event: the VI Sea Turtle Festival 2018, which strives to promote environmental awareness and the conservation of these chelonians. 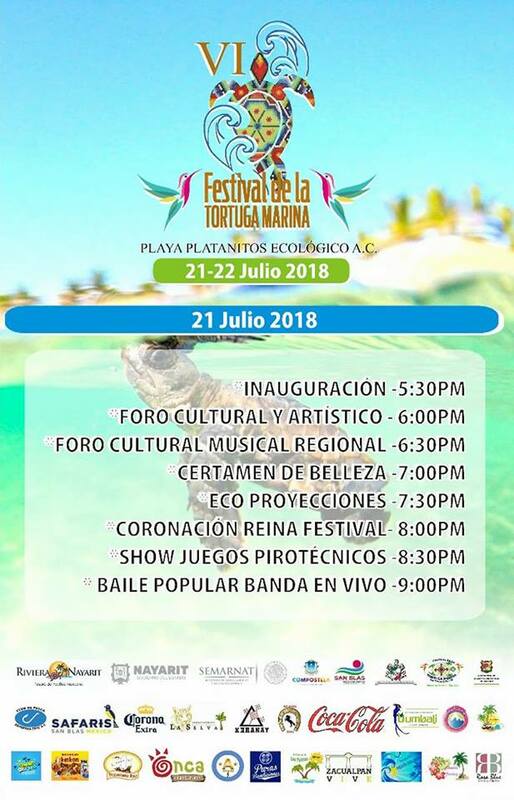 The festival, organized by Playa Platanitos Ecológico, will take place on July 21-22, coinciding with the sea turtle hatchling liberation season and summer vacation. It will be a great weekend of sports, cultural, and artistic activities for visitors. This year the organizers have prepared a very complete program with activities for the entire family. The inauguration is on Saturday, July 21st at 5:30 p.m. with a ceremony attended by the local tourism, state, and municipal authorities, as well as special guests, to be followed by a cultural and artistic forum at 6 p.m. On Saturday the festival will continue with the traditional beauty pageant to pick the new queen, concluding with a display of fireworks and a dance to the beat of a live banda group. 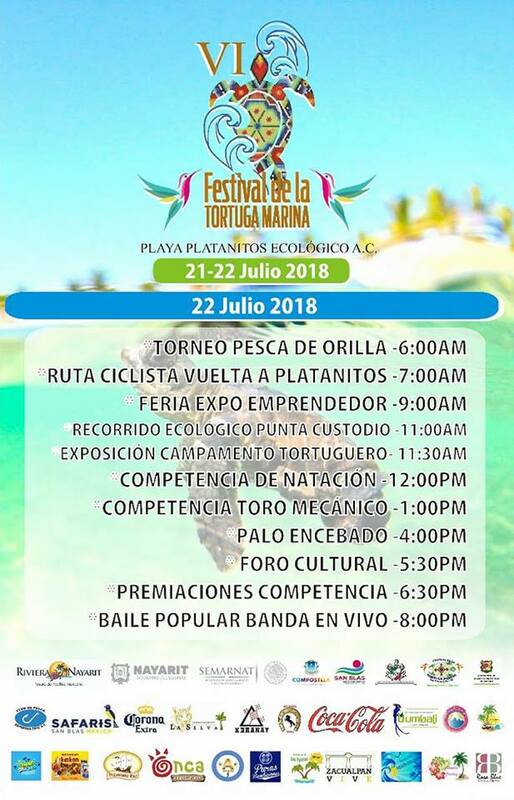 The sports activities will begin early on Sunday the 22nd: A Shore Fishing Tournament at 6 a.m., an eco-tour from Playa Platanitos to Punta Custodio at 11 a.m., and a swimming competition at noon sharp. The program also includes an Entrepreneur Expo-Fair and other activities such as a mechanical bull, a greased pole, a cultural forum, and the closing ceremonies with prizes handed out to the winners of the competitions at 6:30 p.m. Another dance with a live band starts up at 8 p.m. All events are free. 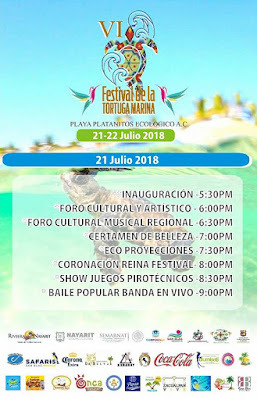 The organizers of the event have expressed on numerous occasions that the community of Playa Platanitos is more than just a “sun and sand” destination and strives to be a sustainable destination where the respect for nature is key. 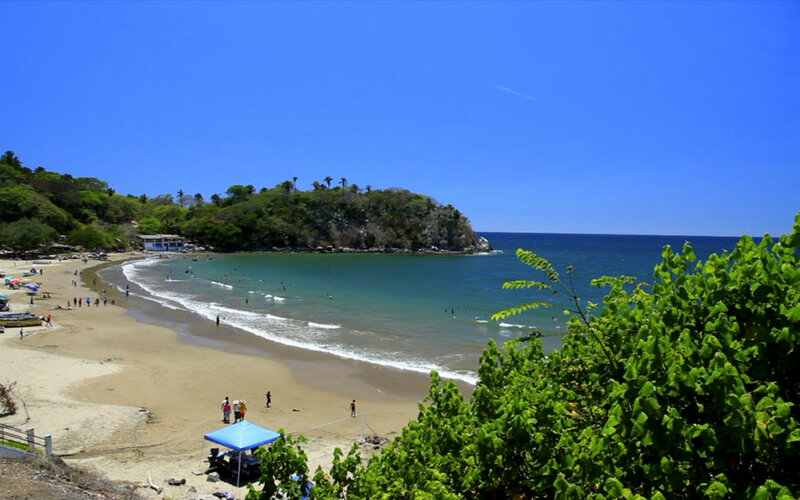 Playa Platanitos is a community of less than 100 inhabitants, the majority of whom are dedicated to commerce, fishing, and sustainable tourism. This fishing village is located about 25 kilometers (15.5 miles) from Las Varas in the municipality of Compostela. La Oficina de Visitantes y Convenciones de Riviera Nayarit (OVC) y la Asociación de Hoteles y Moteles de Bahía de Banderas (AHBB) trabajan intensamente en la promoción del destino, con el respaldo del Gobierno del Estado de Nayarit a través del Fideicomiso de Promoción Turística (Fiprotur). La oferta de productos turísticos relacionados con la cultura es un invaluable activo para estas acciones de promoción.